The gut is where its at. It seems that every health article you read links gut health to your overall wellbeing, something we are also on board with. 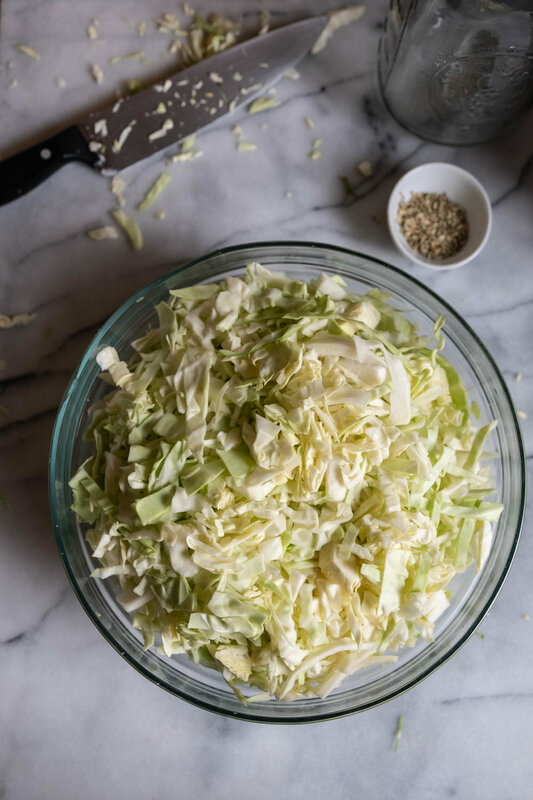 One of the best ways to keep your gut in check is to eat a lot of fermented foods, like sauerkraut. In the spirt of DIY, we tackled this easy process to create our own. What did we learn? Time is of the essence here. 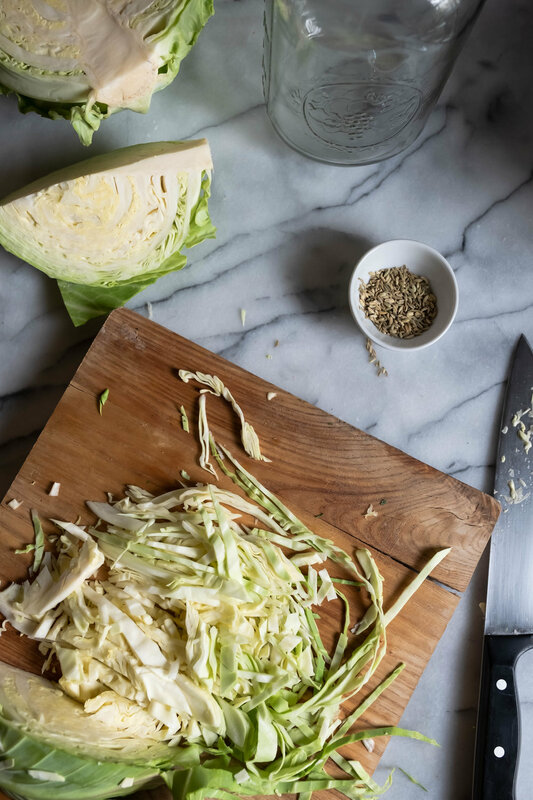 While the only ingredients you need is cabbage, caraway seeds and salt, the key to this flavorful condiment is letting it ferment for as long as possible. Here is what we found out of the course of a few weeks. But just like fine wine, sauerkraut gets better with time! Sauerkraut was still green, crunchy and a tad salty. It didn’t have the softness that we normally associate with it, so we secured the lid back on tight and let the healthy bacteria, lactobacillus, continue to do its job. The same as week one, although the kraut was less green. Repeated week one’s action of putting the lid on and waiting some more. The results were much better, although, it was saltier and have read that the more time you ferment the salt turns to sour. We enjoyed this with some pierogis but decided to let it be and come back in a few weeks. Flash forward a few weeks and the kraut was perfect, the overt saltiness faded and it was perfectly sour. After eating, the remaining kraut, we let ferment some more. Directions: In a large bowl, add shredded cabbage, salt and caraway seeds. Using your hands, massage the cabbage - this will take about ten minutes. As you continue to work the cabbage, it will begin to break down and water will be released. This is a fascinating process! Once it has been massaged, pour into a fermenting or mason jar that has been thoroughly sterilized. Seal tightly and put in a non-drafty spot that isn’t too hot or cold. Feel free to taste along the way, this connects you to the process even more. *Avoid using table salt for this recipe, since the additives can effect the fermenting process.